So your small boat isn't equipped with a battery compartment... no problem! 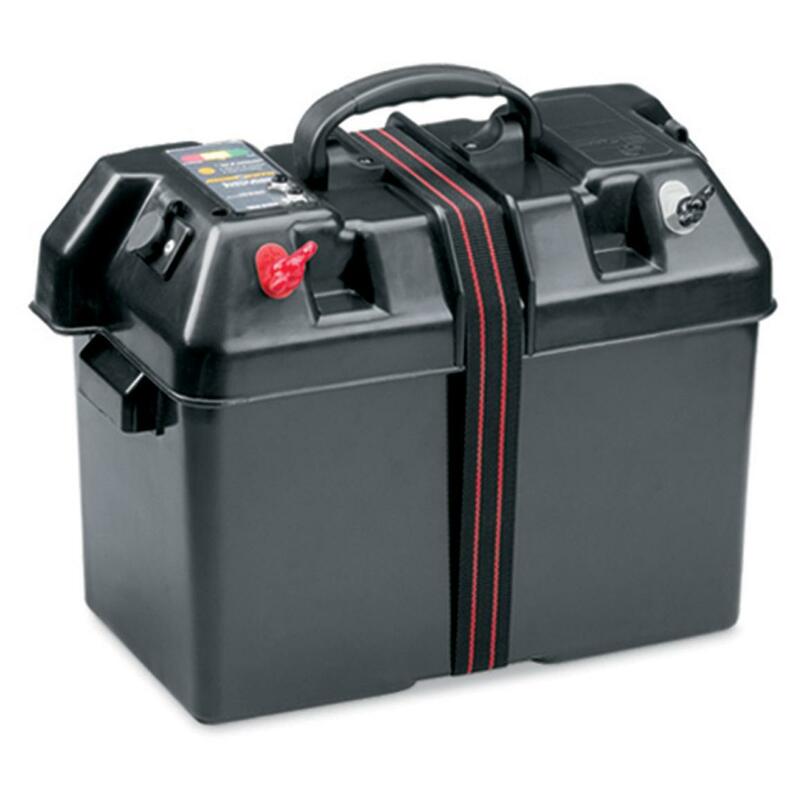 This Battery Box by Minn Kota® features easy battery access and convenient features that provide a great alternative for group 24 and 27 - size batteries. The external battery terminals allow trolling motor leads and charger leads to be connected without opening the box, while the built-in battery meter lets you know how much juice you have left. Outside dimensions are 16.5" x 9" x 11.5"h.
You can't ever go wrong with Minn Kota! Order today! Minn Kota Trolling Motor Battery Box Power Center is rated 4.6 out of 5 by 14. Rated 5 out of 5 by Steve B from Great Little Battery box Good features for a battery box. Easy push-button check of reserve power. 12-volt outlet. Easy to attach the terminals without tools. And the handle makes it very easy to carry. Rated 5 out of 5 by CCW1938 from excellent product The power center was much better than the one it replaced. Just fished with it for a week and is worked fine. Rated 5 out of 5 by ARCHER1945 from DOES EVERYTHING I NEEDED ONE TO DO! It is well made; I feel confident lifting it with the handle with the battery in it (if I were designing it, I probably would have put two straps on it for safety but the one is quite strong), the power outlets are good to have for many accessories in a canoe (my fish locator works fine from it with no problems) and it fits a #27 deep cycle battery with room to spare. I believe it could hold a #29 but don't have one to try in it right now. I tested the battery power indicator along with a good voltmeter and it is very close to the state of the battery voltage. The outside connections for the motor itself are well made and convenient since you don't have to open the case to attach the motor leads. Mine is used on a canoe which I use alone so I made an extension cord (I suggest using wire heavy enough to handle the amperage and length of the wire; mine is quite oversized since I had it on hand) so I can set the battery in the front of the canoe for better weight distribution and it is out of my way in the back and center of the canoe. I have had several battery boxes in my life (a long time) and this one is by far the best. Rated 5 out of 5 by RANDALL from Looks good. 114"l. x 48"w., 135 lbs. Your portable passport to big bass country. Big storage for all makes and models.